When we talk about cardamom or simply “Elaichi” it comes to a picture of small green herb which is easily available in our Indian kitchens. Either it is added in the sweet dish or simply in the morning tea, we consume it in many different ways. Its usage can be traced from ancient times and still it is the first choice among the Asians when it comes to spices. It is the variety of usage and huge popularity which makes it the queen of spices and it is one of the costly spices of all the times. Cardamom is commonly known as elaichi in Hindi and Bengali, in Gujarati it is called Elaichi, in Kannada it is called Yelakki, in Malayalam it is called Elathari, in Marathi it is called Velchil, in Oriya it is called Alaichi, in Punjabi it is called Elaychi, in Sanskrit it is called Ela, in Tamil it is called Yelakkai or Elakkai, in Telugu it is called Yealak-Kayulu or Elakkayi and in Urdu it is called Ilaychi. There are many benefits of this small green color medicine as it provides control of cholesterol, cardiovascular diseases, and the most deadly cancer. It is also helpful to improve blood circulations and several sexual diseases which affect the human body. This amazing little genius is full of surprises and we will discuss its health benefits one by one. But before that, we must know what the different types of Cardamom available in the market. There are three different types of cardamom which can be seen in the market- green cardamom (most common), black cardamom (more of medicinal use) and Madagascar cardamom. The difference is the size, origin, aroma and constituents. You can buy the cardamom still in the pods, or simply the black seeds but the fresh pods are of more use for culinary. This type of cardamom is mostly cultivated in South India, this is the most superior type of cardamom available. You can find this cardamom in pod as well as in powder form. The shelf life of whole pods is long and can retain the aroma of the seeds. •This type is used to add flavor to both savory and sweet dishes. •It is a fragrant spice which is added to rich curries and milk based preparations. •You can also spice your Tea and coffee with cardamom. •This spice can be used to add a spicy taste to cakes and breads. The pods of brown cardamom are larger in size than the green cardamom and have a kind of hairy texture. They look like small fibrous coconuts. •This type is mostly used in savory dishes like biryani and curries. 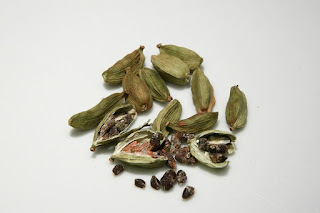 •These cardamoms are a vital ingredient in garam masala which is a popular spice mix in India. •The dark brown seeds of this cardamom have amazing medicinal value, as they are loaded with carbohydrates, protein, moisture, volatile oil, crude fiber, phosphorus, calcium and iron. •The volatile oil in this spice comprises of cineol, terpinene, limonene, sabinene and terpineol in the form of formic and acetic acid. Ground cardamom is made by crushing the pods using a mortar and pestle. This powder is used to flavor many dishes. This ground spice is less flavorful than the whole pods and you can easily find this powder at grocery stores near you.